Discovering and then applying the full potential of data to public safety and resilience is not a straightforward process – it requires dynamic interaction and participation from many parties. BlueLightCamp has a long association with BAPCO, and for two years was held immediately prior to B-APCO’s Annual Exhibition and Conference in Manchester. This year, Sasha Taylor and I decided to try something different, and we held BlueLightCamp at Ordnance Survey’s headquarters in Hampshire. The choice of location was not by chance, as it’s also where my ‘day job’ is, leading an open data initiative known as ‘Hampshire Hub’ on behalf of 20+ partner organisations. 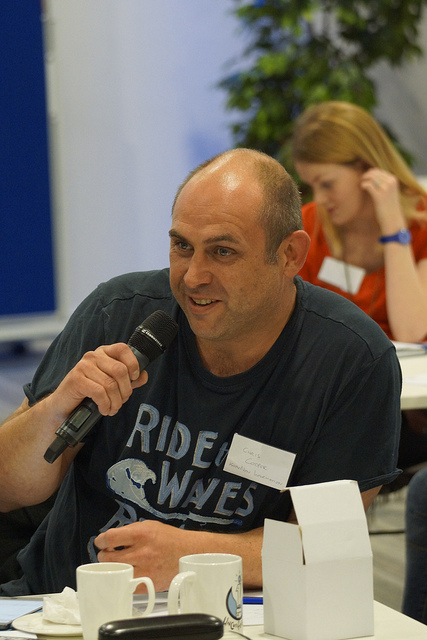 Holding BlueLightCamp on ‘home turf’ provided a great opportunity to introduce new people to the world of ‘unconferences’ and ‘hackathons’, including local business leaders like Chris Cooper, who tells his story below. My story is really about serendipity, with the first serendipitous moment being when I was invited by Mark to attend an unconference and hackathon called BlueLightCamp. I was unsure as to what I had let myself in for. As I am a humble IT engineer I do get excited about using data to achieve an agreed end or outcome. However, what I noticed at BlueLightCamp is that an outcome was often the last thing considered when deciding what to do. We all seemed to be thinking about what we could do with the data and tools available – it is cool being able to do new stuff after all! This is not a bad approach but it has limitations – namely, that if you want to take a hack experience and propel into real life then someone has to pay for it, so a positive business value has to be obtained. Simply having cool data at your fingertips is not a business case, sadly. So this got me thinking, which lasted two weeks until my next bit of serendipity at a Big Innovation Open Data day at Harwell. There, the STFC (Science and Technology Facilities Council), ODI (Open Data Institute) and the government’s open data evangelists offered the opportunity to win a voucher to deliver a new open data proof of concept. Well, how could I refuse! The serendipity surprise number three was that Know Now Information won the Open Data voucher. The paper I wrote was called ‘Whether you do or Weather you don’t’ –or ‘WUDOWUD’ for short. The paper proposed that by using the weather as our event trigger, it should be possible (due to improved forecasting) alongside a view of the historical impact of weather on a location, determine a more pro-active, cheaper, more efficient/safer alternative operation. In short, we now have an outcome. Serendipity four is a personal benefit – I live in Hampshire, and my county would be smarter tomorrow than it was yesterday, so it could mean my tax bill could be reduced. The Hampshire Hub though is not just the source for most of our data; it is also going to be the home for the results too. This is important because the hub is not just a repository of data: it is a partnership of data owners too. They are key, as data owners can describe why their data is relevant and important. Engagement of data owners is fundamental to a successful project. After a series of workshops with the Hartree team from the STFC we now have an agreed set of data stores that we are going to try to unlock. The first is simply looking at flooding at fords. This costs the county and its citizens thousands, in terms of manpower, lost assets (cars floating) and lives impacted. The second was finding datasets that local politicians and leaders can use to advertise that action is happening. Getting the information out to the citizens of Hampshire is key. Enabling a politician to tell a great story is even better. We are now coming towards the end of our exercise. Waiting for the results of the data correlation and seeing if we have any clusters of events based on the weather. Assuming those are forthcoming, the next step will be to run a ‘thought experiment’ determining a new alternative approach. Then checking this new process is more resource and cost effective with a better set of outcomes than the existing status quo. Hopefully this will give me serendipity number five. Chris has described how several serendipitous events sparked an idea which, together with availability of open data, led to a project which has the potential to deliver real change. Without BlueLightCamp, Chris probably wouldn’t have come up with the idea. Without the availability of funding, the project might never have got off the ground. Without support from sponsors, BlueLightCamp may not have happened at all. BlueLightCamp will be returning again in 2015, probably in June.